Go See Campus helps high school students and parents plan a single college visit or an entire road trip! Get to know our resources with this interactive walkthrough. Before you make a college visit, it’s a good idea to know the factors that will help you choose a school. For example, you might want to go to college that's located in a certain geographic region or that has a large student body. Alternatively, you may be interested in specific academic majors or sports. Which best describes you? I’m not sure yet what factors I want in a college. In advance of a college visit, there are plenty of opportunities for you to learn about what you do and don’t want from a school. Talk with people who know you and your interests. Your parents or school counselor may have ideas about what to look for in a college. Explore school websites to learn more about the variety of options that are available. Go See Campus’ college search feature makes this easy! Speak with college-age friends and family. Ask them about their own admissions experiences and how they decided on a school. Take these opportunities to decide what matters to you. Then, use these same factors to evaluate each college visit you make! I know exactly what factors I want in a college! You’ve got to know which schools you’d like to explore before you can plan a college visit. Which best describes you? I want help learning about colleges. Search for colleges based on the factors that matter to you. Then, review their websites to get a sense of what each has to offer. Check out the Go See Campus Bookstore. Guidebooks available there can offer insights into colleges from other students, parents, and experts. Connect with university representatives. Go See Campus helps you find your regional representative so that you can ask questions not answered elsewhere. Follow colleges online through social media. You can get updates and information about the school’s programs, events, and other offerings. We also post this type of information on Facebook, Twitter, and Google+. I know what colleges I want to visit! Go See Campus offers The College Trip Planner. Use it to create an itinerary for your college visit, download maps and parking details, and get the information you need! Before you get started, though, you might want to learn how to make your trip an amazing and useful experience. Choose an option below. Help me get the most from a college visit. Go See Campus offers a “College Advice” section that will teach you how to research, prepare for, and plan an effective college visit. Start by reading “Go See Campus When Choosing a College” and “College Trips as Part of Your Search.” Together, the two articles offer a great overview of the process. Then, check out the information available in “College Advice on Making the Most of Trips.” This section offers greater detail about what to ask during a tour, meeting professors, and more. Since we add resources to our website on a continuing basis, be sure to sign up for information and updates from Go See Campus! I’m ready to plan a college visit! 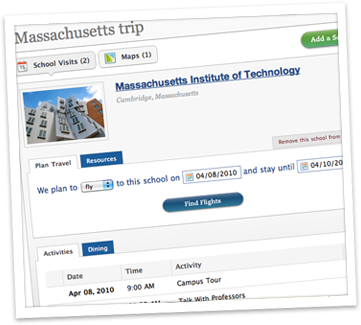 Go See Campus also offers “College Advice on Planning Trips.” There, you can learn about common challenges and solutions; get ideas for how many campuses to visit; and research special topics, like meeting with a coach on a college visit. Once you’re ready to hit the road, use the Go See Campus College Trip Planner to organize your college visits. Go to “Book Travel for Your College Visit"
Save money by booking flights, hotels, and car rentals all at once! Go to “Learn More about the College Search"
Go See Campus focuses on helping you get the most from your college visit, but we also offer resources for other parts of your college decision. This section of our “College Advice” page includes articles on getting to know the admissions staff, preparing for a college interview, and other topics. Purchase test prep materials, college guides, and travel tools. Our site provides a variety of other college resources, including guidance in the admissions process and help paying for school. You’ve reached the end of the walk-through. Good luck on your college visits, and don't forget to tell the community about your experiences!